Just because you are dealing with limited space doesn’t mean you can not have gardens that are just as impressive as their larger counterparts. Some of the best designs don’t require a lot of space to pull off a stunning display. All you need to do is plan out your design thoughtfully and research different tips and techniques for conserving space. Here are a few ideas to help get you started that you can use to draw inspiration from! Mailbox Gardens: Mailboxes are often the centerpieces of many small garden designs, especially in large developments. There are a few factors to consider when planting around your mailbox, such as the proximity to the street, your line of sight when pulling in and out of your driveway, and access to the mailbox itself. Gardens up against a busy street tend to take a lot more abuse than those in your backyard, so make sure you choose plants that are hardy, and not easily broken or blown over. Keep in mind your view of the road when you’re coming into, and leaving your driveway. Plants that are too tall might obscure your view and could potentially cause an accident. Also, be sure to leave enough frontal space in your garden design. You need to make sure you and the mailman will still have easy access to the mailbox every day. Annual Gardens: Annuals are always a seasonal favorite in many small garden designs. The right combination of color and texture can transform just about any location into a work of art. While there are a number of shade loving plants, annuals tend to need a lot of sunlight to reach full bloom, so make sure you account for this when choosing your location to plant. Depending on what zone you live in, some hardy annuals may even survive the winter if you give them a generous layer of mulch to insulate them and absorb the sun’s heat during the cold months. Perennial Gardens: Adding perennials to your small gardens will provide you with year after year enjoyment with a little weed maintenance each season. Perennials are a great idea for people who don’t want to have to replant their garden’s flowers every year. Perennial gardens tend to be more foliage and textured plants, but they are certainly not lacking in color either. A lot of perennial plants, such as lilies, get very wide and lush, and have a habit of crowding out smaller plants. Make sure when you plan your small gardens, that you don’t put too many plants in a small space, or you might end up having to pull some of them out in the middle of the year when the plants fill out the garden and start fighting for space. Shade Gardens: Shade gardens are often overlooked when compared to annual and perennial plans because shade plants generally have fewer blooms and lean towards the leafy and woody types of plants. In the right location however, shade plants can turn simple small garden designs into one your neighbors will envy. Hostas are always a popular favorite in shade gardens because of their full, broad leaves, and numerous varieties and textures. Hostas also have shallow root systems which make them easy to plant and separate later. Hostas also will get very big in just a few short years, so make sure you space them out accordingly in your small gardens. One tip about growing hostas: while the blooms are pretty, they also take a lot of nutrients away from the plant to maintain, cut them off as soon as they sprout and watch what a difference it makes in the overall fullness of the plant! Intimate Gardens: Sometimes the best small gardens you can come up with are those that you can share with someone you love. What is the point of putting all that time and effort into transforming your yard into a thing of beauty, if you can’t share it with someone? 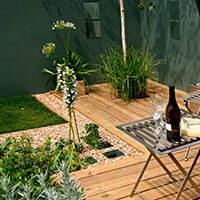 Consider making a small intimate garden where you and your spouse or partner can spend time together. It doesn’t need to be elaborate or intricate; usually the simplest ideas are some of the best! Consider building a garden around a bench, or a swing. Make sure you face the seating towards something worth looking at! You could try a small patch of grass surrounded by a border of tall perennials, lined on the inside with sweet smelling annuals. Sounds like the perfect place for a romantic picnic, or just a quiet place to unwind and let an afternoon pass you by. 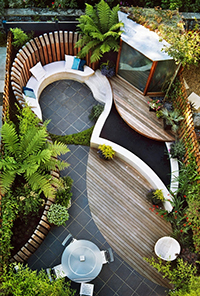 There are endless possibilities you can come up with for small gardens, try something outside of the box. 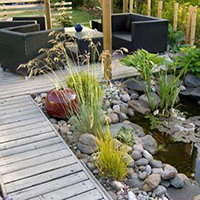 Water Gardens: Water gardens are a timeless classic! Who does not enjoy the calming sounds of running water? 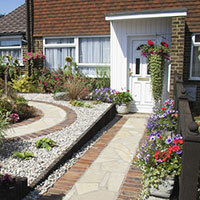 Water features are available in a wide range of sizes that are sure to fit into any small garden. If you don’t want the hassle and maintenance of waterfalls or fountains, consider a koi pond with water lilies. Most pet stores that sell fish also sell a variety of water plants that you can work into your small gardens. If you have a little woodworking experience, you could fashion a small deck or patio around, or even along one side of the water feature. Water features also attract wildlife like frogs, which depending on your perspective might be a good thing or a bad thing.